As we get closer and closer to that dreaded annual date in which we tell the government why they should take our money to fill their fat coffers, I can’t help but get angry from the fact that, like when you’re playing against the house, the U.S. Internal Revenue Service can never lose. Well, that’s not necessarily true, sometimes the mighty IRS can be toppled, but usually it seems like this feat can only accomplished by someone with either a lot of money or a lot of time on their hands. But what about the smaller battles, are those ever winnable and are they even worth it? When the IRS is late with sending you notice to pay and impose penalties on you, or you believe that the IRS made an error in calculating how much you owe, or if, god forbid, you received the dreaded notice of audit, can you ever win those disputes? Most would say no or that the legal nightmare you’ll have to put yourself through isn’t worth the effort. However, this generally held belief isn’t necessarily true: you can win… sometimes. I mean, that’s why there are tax attorneys, right? Now if what I’m getting at is piquing your interest, and I think it is *wink wink*. Either that, or you just read my headline. Keep reading, because I’ve got five tips to help you take on the IRS. However, before we go any further, I want to make one thing clear: fighting the IRS isn’t easy. Like every possible legal issue, especially when it comes to the government, even if you know you’re right, you’re still going to have to prove it, and that takes a lot of time and diligence. Now I’m not saying that you have to necessarily possess the vigilance of a tax protestor, but winning a dispute against the IRS is a lot of work and you have to stay on top of your game if you even want to have a chance to win without having to bring out the big expensive guns (meaning hiring a tax lawyer). And what better way to segue into my first tip. You know that notice you got from the IRS that says you owe them money? Yeah, that’s not something that you just want to sit on. Act on it right away. 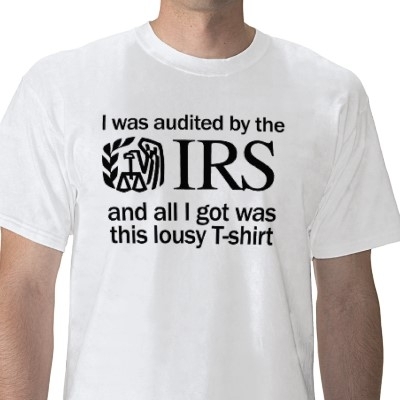 If it’s an audit, get ready to file an appeal, or as the IRS calls it, a protest. You don’t have to go to tax court and you don’t need your own lawyer, you can represent yourself if you desire. Many people are unaware that the IRS actually has an internal appeal division called the Office of Appeals. This is your first line of attack against the IRS. Here you can present your case and show why you shouldn’t owe any money. Just remember to do it within the 30 day time-frame. This probably should be my first tip, but I’m too lazy to shift up. Anyway, before you act, take an honest look at your chances of winning. You need to have your supporting records in order along with any other documentation that can support your claim. Evaluate whether or not your case is too complex to handle on your own, if it is you might have to hire a tax attorney to represent you. Determine whether or not you need to seek the advice of a tax professional who can give you a better idea of your chances of winning. But above all else, compare how much you are going stand to gain by winning your case versus how much you stand to lose to do it (i.e. lost wages to go to court, attorney fees, time, etc.). Taxpayer Advocacy Service (TAS), remember it as it might just save you a ton of money. This is another little known service to most people. The TAS is an internal office within the IRS designed to assist you on your tax issues. Whether it’s supplying you with the necessary documents to help your case or suggests ways for you to go about your appeal, this service is designed to help taxpayers, as weird as that may sound. They also use your feedback to suggest changes that may actually take affect within the IRS. If your issue still hasn’t been resolved to your liking and you want another avenue of appeal, then sue the IRS in the U.S. Tax Court, i.e. real court. You can present your case here to judges who specialize in tax issues. But if you’re going this far, you probably should be hiring a lawyer since it’s probably a pretty complex case; that or it’s just the principal, damn it. Sure you can also sue the IRS in a district court, but this can be expensive as many of these courts may require you to pay what you owe upfront before hearing your case. Of course if you win, you get your money back, but why chance it? So you’re done fighting, chances aren’t looking too good in your favor, or you’re just tired? Regardless, if you just want to pay off your balance, call the IRS and see if they can cut you a break. If you’re really broke or low on funds and have the documentation to prove it, the IRS may reduce the amount you owe. They can also put you on an installment plan to make the amount you have to pay more manageable. However, like my second tip, this is something you may want to consider early on. Why? Because the IRS charges you interest on the money you owe. See, aren’t you glad you read this post? Fighting the IRS can be tough, but hopefully these tips will help you out a bit. You got to find a way somehow to stick it to their rude customer service reps. I recieved a Levy Notice from my Bank. No Notice ever recieved by me before this date. A Notice of taxes due on a IRA closing that I never had. I disputed the back taxes and the Bank, Wachovi and/or the IRS could not produce the records, this was a year ago, never heard back till today when I recieved the collection by my Bank. I’m filing a “CDP” form for an Appeals Hearing; is this the approporate action to date ? LOOK FOR HELP AND WANTING TO FILE LARGE SUIT AGAINST IRS. FILE TAX 2009 BUT IRS SAID I DID NOT .FILE TAX IN ARIZONA IN 2009 IRS SAY I NEEDED TO FILE IN CALIFORNIA. LIVED AND WORK IN ARIZONA AND CAN PROVE IT. IRS WANT ME FOR BACK TAX FOR 10.000.00 THIS WAS TO BE OVER WHEN I PROVE THAT I FILED IN 2009. MY SON NAME IS ROMAN D ,DAUTHER ROXANA GINA MONTANO LIVED IN MY HOUSE IN BAKERSFIELD,CA IN 2009.
now i can’t leave the usa area because my life -and freedom are most here. than any current ones and more safe from rays from the sun because my dad and my company is about magnetics. it is an exchange for leaving us free from taxes.